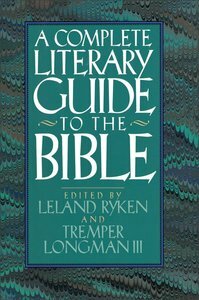 The aim of Complete Literary Guide to the Bible, edited by Leland Ryken and Tremper Longman III is to insure consistency in method and scope with a view to integrating literary and biblical studies. The book has four parts: The Bible as Literature, The Literature of the Old Testament, the Literature of the New Testament, the Literary Influence of the Bible. About "A Complete Literary Guide to the Bible"
Leland Ryken (Ph.D., University of Oregon) is Clyde S. Kilby Professor of English at Wheaton College in Wheaton, Illinois. He is the author of more than one hundred published articles and essays, and he has written, edited or contributed to (so far) twenty-five books, including The Word of God in English: Criteria for Excellence in Bible Translation (Crossway), The Christian Imagination: The Practice of Faith in Literature and Writing (Shaw), Dictionary of Biblical Imagery (InterVarsity Press), The Discerning Reader: Christian Perspectives on Literature and Theory (Baker) and A Complete Literary Guide to the Bible (Zondervan). His most recent books have been on C.S.Lewis' works A Reader's Guide Through the Wardrobe and A Reader's Guide to Caspian: A Journey into C. S. Lewis's Narnia and Understanding English Bible Translation: The Case for an Essentially Literal Approach. He is a frequent speaker at the Evangelical Theological Society and served as literary stylist for The Holy Bible, English Standard Version. Tremper Longman III (Ph.D., Yale University) is Robert H. Gundry Professor of Biblical Studies at Westmont College in Santa Barbara, California. He is also Visiting Professor of Old Testament at Mars Hill Graduate School, Westminster Theological Seminary and adjunct of Old Testament at Fuller Theological Seminary. He lectures regularly at Mars Hill, Regent College in Vancouver and the Canadian Theological Seminary in Calgary. He is the author of commentaries on The Book of Job (Baker Commentary on the Old Testament Wisdom and Psalms) along with the published volume on Proverbs; Exodus (The Two Horizons Old Testament Commentary) and Jeremiah, Lamentations (New International Biblical Commentary), Daniel, Proverbs, Ecclesiastes and Song of Songs. Longman is the author of How to Read Genesis, How to Read the Psalms, How to Read Proverbs and Literary Approaches to Biblical Interpretation, and co-editor of A Complete Literary Guide to the Bible and co-author with Dan Allender of Bold Love, Cry of the Soul, Intimate Allies, The Intimate Mystery and The Intimate Marriage Bible Studies.